Postings relating to new shooters. Thanks to generous donations to the New Shooter Ammo Fund, I have been able to purchase an additional 80 rounds of .223 ammo for teaching new shooters. While 80 rounds might not seem like much, most new shooters I take to the range really seem to love the ARs, and so an extra few magazines worth is always useful. I could have gotten quite a bit more .22LR than .223, but the local shop was short on .22, and didn’t have stuff that my 10/22 seems to prefer. Many thanks to all those who’ve donated. The fall semester is off to a busy start, and I don’t have as much time as I’d like to take new shooters to the range (heck, I don’t know any more new shooters! Anyone in town want to send them my way?) right now, but hopefully that’ll become possible as grad school applications go out. Rita and Teresa have been accompanying me to the range for some time. They are regulars at turning ammo into smiles. Once again, it was a beautiful (albeit hot) day in Tucson. 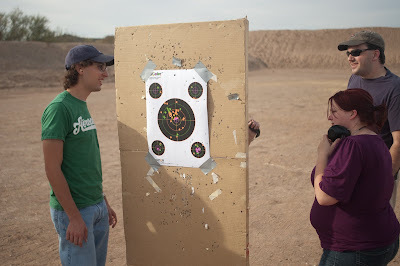 Thank goodness the Tucson Rifle Club has overhead shades for the firing line. Rita, myself, and my med student friend Ian spent a few hours on Saturday reloading .223. Out of the 120 or so rounds we fired today, there were only three failures (( Two were jams due to the out-of-round bullets we’re using. One was due to one of the rounds having some goopy black residue on it. )), none of them dramatic (( Note for reloaders: double-check your bullet weights against the load data tables. I foolishly assumed that we were using 55gr bullets as that was what I normally load and picked a middle-of-the-road load from the tables. Turns out we were using 62gr bullets and the powder charge we were using turned out to be rather near the never-exceed range for .223. Eep. Fortunately, we never actually crossed the never-exceed line, and even so the loads were several thousand PSI below the 5.56mm NATO pressure spec, which is what the rifle was rated for. Fortunately, we discovered this condition at the reloading bench after we loaded a few hundred rounds, so we were able to confirm that the loads would be safe by consulting the tables. The rifle did not explosively self-destruct, which is good. )). It’s nice actually having some .223 ammo, as my ARs are quite voracious. I had also dug about in my closet and found some .30-06 reloads, so we were able to shoot the M1 (Rita has a bit of a love affair with my M1, and really enjoys shooting it.) a bit. Shooting the M1 seems to be a family trait, as Nolan also greatly enjoyed shooting it. There’s something immensely satisfying about recoil, .30 caliber bullets, and large dust clouds behind one’s targets. 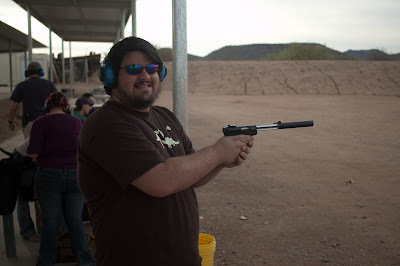 As usual, the suppressed Ruger 10/22 was a big hit, as were the Ruger MkIII and Glock 19 pistols. Fun was, as usual, had by all. The fall semester starts up again in about a month, so I’m hoping that I’ll be able to find some new shooters to take to the range then. For now, I’m happy that I managed to get another new shooter out to the range. When Rita and Nolan’s parents are in town, I may have to take the whole family out shooting. The Brady Campaign supports banning military-style semi-automatic assault weapons along with high-capacity ammunition magazines. These dangerous weapons have no sporting or civilian use. Their combat features are appropriate to military, not civilian, contexts. This is Louis. 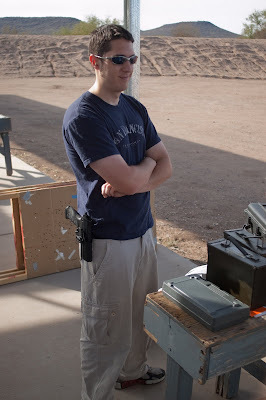 Attentive readers will recognize him from previous posts as he is a regular attendee of trips to the range. The gun he is firing ((Note the brass ejecting.)) is a Glock 19, chambered in 9x19mm. It is equipped with a Glock 33-round extended magazine. One will note that Louis is demonstrating good shooting form and is displaying a smile of enjoyment. The extended magazine allows Louis to spend more time shooting and less time stopping to reload magazines. Here is Rita, who also frequently accompanies me on trips to the range, fires the Glock 19 with the standard-capacity 15-round magazine that is one of two included with the purchase of a new pistol. This magazine allows for 50% more capacity than the Brady-recommended 10-round low-capacity magazines while still fitting flush with the bottom of the pistol’s grip. At the range, having five fewer rounds means more changing magazines and more time spent reloading — less time having fun. This was her first trip to the range. Here she’s firing a DPMS A-15, an AR-15 variant. It is equipped with all the standard features: a flash suppressor, bayonet lug, handguards which encircle the barrel, a 30-round standard-capacity magazine, a pistol grip, and a collapsible stock. In this particular context, the bayonet lug is not being used, and so is no more dangerous than any other piece of metal ((The edges of the lug, however, are a bit sharp.)) on the rifle. The flash suppressor is not really relevant, as Danielle is shooting during the day and so does not need to worry about the flash from her muzzle affecting night vision — that said, the vents on the flash suppressor reduce the amount of dust kicked up from the ground, making her shooting experience a more enjoyable one. The pistol grip and collapsible stock allow for comfortable shooting: she has adjusted the stock to a length which suits her. The ordinary fixed stock is too long and it is often uncomfortable for smaller shooters like Danielle. The pistol grip allows for a firm, ergonomic, comfortable grip on the rifle. The forward handguards, which she is not using in this particular picture, prevent her from being burned by the hot barrel when she chooses to use her right hand to hold the gun rather than support her shooting hand. The 30-round magazine is the standard size for AR-15 type rifles, and allows her to fire for a good period of time without needing to stand up or move around to fetch and load a new magazine. This also allows her to focus more on shooting rather than changing magazines. In this particular picture, she’s also using the magazine to support the rifle, allowing for more stable, accurate shooting. The very features that the Brady Campaign claims are “combat features” that “facilitate the killing of human beings in battle” are being used by Danielle and tens of millions of other civilian shooters to enhance their safety (e.g. handguards that prevent burns) and comfort (e.g. ergonomic pistol grip and a stock that can adjust to be comfortable for both larger and smaller people). 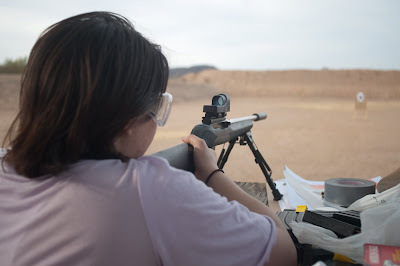 Here Danielle is seen shooting a Ruger 10/22 rifle, chambered in the lowly .22 Long Rifle cartridge, which is equipped with a threaded barrel and a Gem-Tech Outback II silencer. The Brady Campaign states that silencers “allow an assassin to shoot without making noise” — while this is true ((Partially, at least — silencers reduce the noise produced by the gun to a safe level, but do not completely eliminate it. )), I think they might be watching a few too many James Bond movies. Assassins are exceedingly uncommon outside of Hollywood films, and any actual assassin will not care about the legality of silencers. They also claim that, “silencers are illegal so there is no legitimate purpose for making it possible to put a silencer on a weapon,” a claim which is demonstrably false: the silencer on this gun is perfectly legal, and I have all the appropriate paperwork in order. 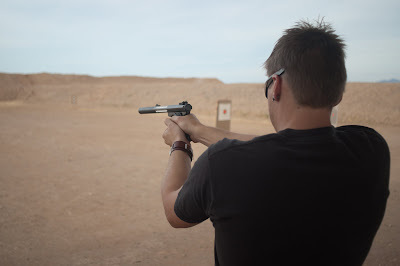 Though I’ve addressed the legality of silencers in a previous post, I want to reiterate that there are perfectly legitimate reasons for wanting to own and use a silencer: I use mine primarily for introducing new shooters to shooting, as the low recoil and noise of a silenced .22 rifle makes for a very pleasant learning experience. 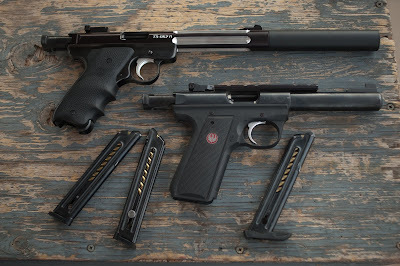 Additionally, the use of a silencer reduces the levels of noise produced by a gun, reducing noise pollution and hearing damage. In conclusion, there are numerous, perfectly legitimate sporting reasons for the private ownership of “military-style semi-automatic” firearms ((Which, I’d like to point out, are functionally no different than non-“military-style” semi-automatic firearms like the Ruger Mini-14.)) and magazines with a capacity greater than 10 rounds. There are plenty of other, non-sporting reasons (such as self-defense, collecting, etc.) for owning such firearms and accessories. In short, the Brady Campaign is full of crap. 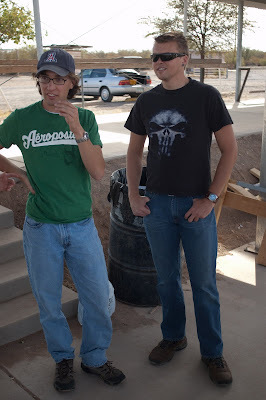 On a more positive note, it was a glorious, sunny day here in Tucson, and I was pleased to spend the day in the company of good friends, fine guns, and delicious food and (after the guns were put away) beer. I checked my email the other day and noted a donation to the New Shooter Ammo Fund from Carl (last name omitted for privacy). Thanks Carl, I really appreciate it. While my schedule is hellishly busy right now, I’ll see about taking some new shooters to the range in the next month or two.